* Please Note: Set is pictured in black finish. Actual set purchased includes the same set of tools, but in brushed bronze finish. Maintaining and cleaning your fireplace and hearth are much more efficient when you have a set of high quality fireplace tools. The Antique Scroll design is a main feature of this attractive fireplace tool set. 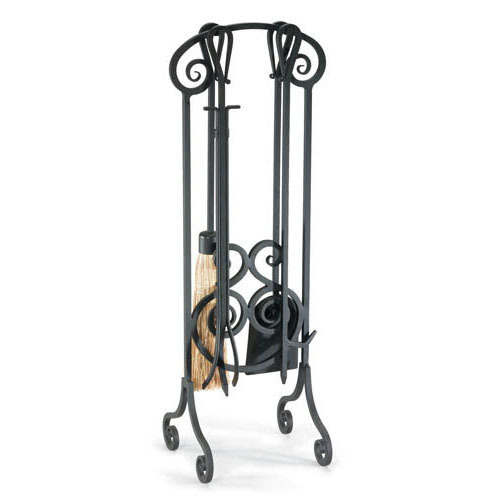 It also features convenient forged loop twirls on the handles and the stand. The five Piece Antique Scroll Fireplace Tool Set features a brushed bronze finish. This set includes a broom, a shovel, a set of tongs, a poker, and a stand.